Manny Villar’s Vista Land signs deal with UP to help spur more opportunities for PH startups to flourish. The University of the Philippines (UP) and Vista Land & Landscapes, Inc of former Senate President Manuel “Manny” Villar signed a deal to build the 5-hectare first School of Technopreneurship in the country. Villar’s wife, Senator Cynthia announced the deal on her Facebook page on Tuesday, June 28. The school will rise at the University Town of Vista City in Dasmarinas, Cavite. UP will design the programs to be offered in campus, and Vista Land will build the initial facilities needed for the campus, hence bringing more opportunities for startup businesses to flourish in the Philippines in a technologically-advanced and supportive environment. “The Philippines takes one step closer to making this economically progressive future a reality,” says Villar, Vista Land President and CEO. 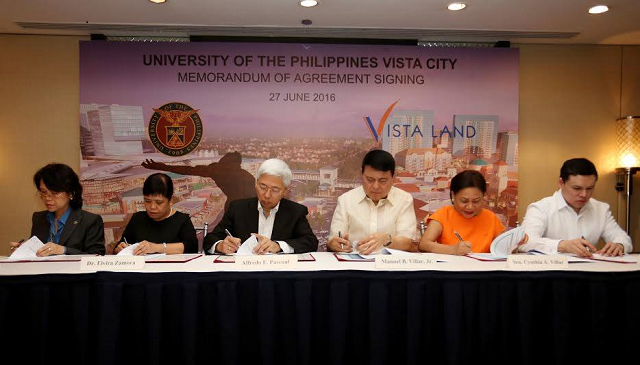 The memorandum of agreement was signed on Monday, June 27, by UP President Alfredo Pascual; Vista Land president and CEO Manuel Paolo “Manny” Villar; Cynthia Villar; Vista Land Chairman Manny; and UP Vice Presidents Gisela Concepcion and Elvira Zamora.